Five students fromNOVA Middle School, Petar Pesev, Anna-Sophie Kloppe, Marie Claire Pechmoller,Dejana Begovic, and William Soderberg took part in the 'Fun, Education, Stop Motion Animation' projectsupported by the British Council. A team of Macedonian primary school teachersworks on introducing stop motion animations in the education process.The aim of the project is to make the education more engaging though the uniqueuse of stop motion animation in a imaginative, innovative and creativeway. 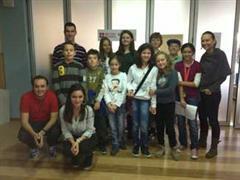 The students from NOVA worked togetherwithstudents from Primary school 'Vlado Tasevski' from Skopje forrecording the voice over of the animations.